One of the few made in India cars to score a 4 star safety rating by Global NCAP. 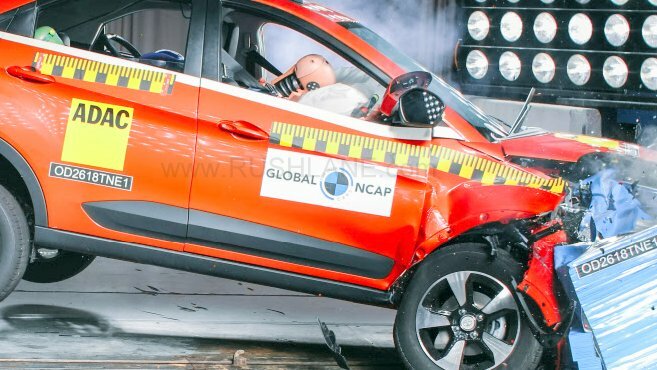 The agency which regularly crash tests made in India cars, Global NCAP has crash tested the Tata Nexon. The new Tata Nexon has scored a 4 star safety rating for adult occupants and 3 star safety rating for kids. Tata Nexon is not the first car from Tata to get a four star safety rating. The Zest too got a 4 star safety from GNCAP. UPDATE – Speaking about the new feat achieved by the Nexon, Mr. Mayank Pareek, President – PVBU, Tata Motors, said, “The Global NCAP results are a reflection of our commitment towards bringing technologically advanced features which are safe yet stylish. With these test results, the Nexon is India’s safest compact SUV, after being one of the most awarded models from the Tata Motors’ PV stable. It is a proud moment for all our Nexon customers today. I am delighted and proud of the hard-work put in by the entire team and congratulate each one for this accomplishment. Our journey to offer best quality products continues.” Watch the crash test video below. Built on Tata’s new IMPACT design policy the Tata Nexon sports projector headlamps with LED DRLs, dual shade fog lamps with a ceramic white strip and 16” diamond cut alloy wheels and LED tail lamps at the rear. Offered in color options of Etna Orange, Moroccan Blue, Glasgow Grey, Seattle Silver, Vermont Red and Calgary White. It measures 3,995mm in length, 1,730mm in width and 1,600mm in height with a wheelbase of 2,470mm while ground clearance is at 200mm. Global NCAP has been testing made in India cars for safety rating, for some years now. It was their first test a few years ago which showed that on a global testing scale, almost all of the best selling cars on sale in India scored a 0 safety rating. The list of cars which have scored a 0 star rating at Global NCAP and are made in India are Hyundai Eon, Ford Figo, VW Polo, Tata Nano, Renault Kwid, Datsun Go, etc. Tata Nexon comes with standard safety features of front double airbags, frontal double pretensioners, ABS brakes and ISOFIX anchorages for child safety. The rearward facing CRS installed with ISOFIX anchorages showed good protection to the 18 months old child, while the ISOFIX forwards facing installed CRS offered good protection for head and limited protection to the chest. All this helped the car achieve a 4 star rating in a crash test conducted at 64 kmph. Below is the full report of Nexon crash test. Speaking about the Nexon, interiors come in loaded with both comfort and safety features among which are automatic climate controls, multi function steering wheel, standard dual airbags, rear AC vents and ABS and EBD. It also gets a 6.5” touchscreen infotainment system with Android Auto and Apple CarPlay along with an 8 speaker Harmon audio system. Passenger comforts in the Nexon AMT are further enhanced with rear air-conditioning vents, adjustable ORVMs, automatic climate control and engine start stop buttons. Rear view mirror, front fog lamps, park assist with rear sensors and camera and dual front air bags besides front fog lamps with cornering assistance are among its safety features. The Nexon AMT gets crawl and hill hold functions. Tata Nexon range topping XZA trim is powered by a 1.2 liter Revotron turbocharged petrol engine offering 108 bhp power and peak torque of 179 Nm torque. It also gets a 1.5 liter turbocharged Revotorq diesel engine capable of 108 bhp power and 260 Nm torque. These engines are mated to manual transmission as well as 6 speed AMT units from Magneti Marelli.